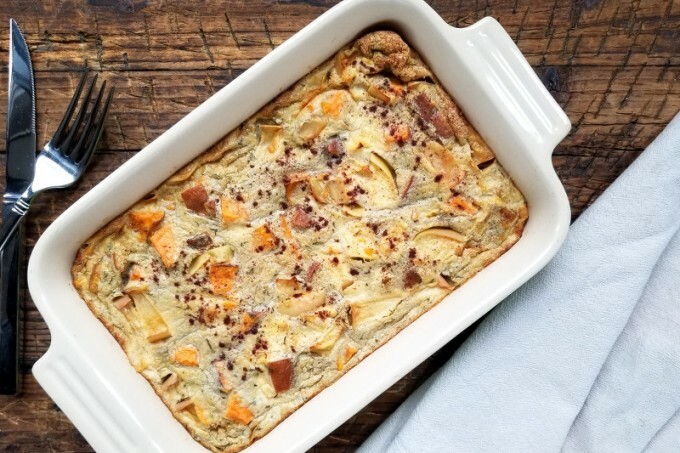 I originally made this to be a breakfast dish, but it honestly works for any meal if you’re in the mood for flavors like fennel and butternut squash. This recipe is also simple and comes together pretty quickly. I recommend doubling the recipe so you have extra for the week! I’ve been eating leftovers in the morning with a couple eggs on top and a little sprinkle of cinnamon. Bonus, this recipe is Whole30 compliant as well! A gluten-free, paleo and Whole30 compliant healthy breakfast recipe designed to be easy to make. Peel butternut squash, remove seeds and dice into 1-inch cubes. Spread squash on baking sheet pan, drizzle with 2 Tbl coconut oil, ¼ tsp salt then roast until soft, about 20-30 minutes. 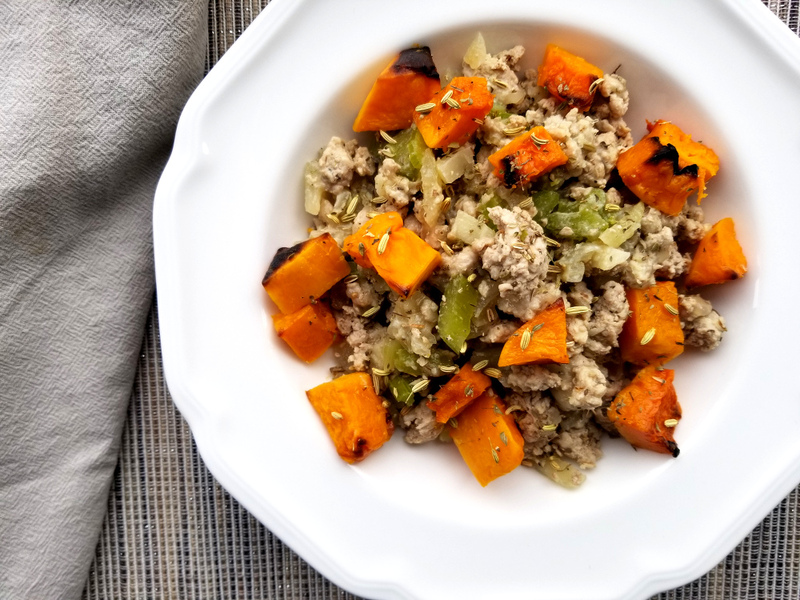 While squash roasts, heat a large skillet over medium heat, add 1 Tbl coconut oil, then brown the ground pork, adding ¾ tsp salt, pepper, and breaking up any large chunks with spatula. Once no longer pink set aside on a plate. In the same skillet, heat remaining 1 Tbl oil, then saute onion for 5 minutes until soft, then add celery, fennel bulb and fennel seeds. Saute for 5 minutes, then add broth, puree, and pork back into the skillet and stir to combine. 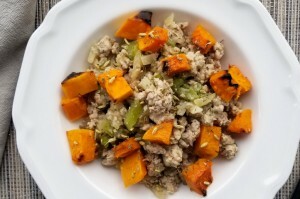 Serve the pork saute with the roasted butternut squash - you can toss them all together or serve the butternut as a side dish. 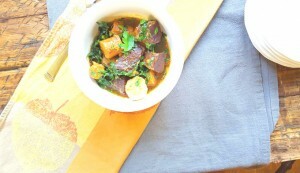 This beef stew recipe belongs to my dear Tru Provisions colleague and fellow chef Elissa. I’ve created a few variations just for the sake of playing with different flavors – sometimes I like to add tomato, so I included that here as an option. This stew is a one stop shop for a meal, but plan ahead as it needs 2 to 3 hours to cook – or you can use an Instant Pot pressure cooker instead for quicker cooking, see the note below the recipe! This recipe is Whole30 compliant as well for any folks looking to do a Whole30 this time of year. 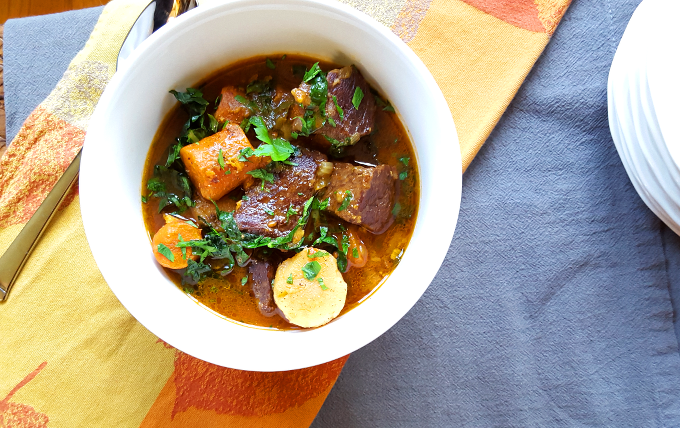 A healthy, Whole30 compliant beef stew recipe perfect for chilly winter nights. Over medium high heat, melt the ghee/oil in a large dutch oven pot (cast iron enabled pots are best for braising). When the pot is hot, sear half the beef until browned, about 3-5 minutes each side. Add the remaining beef and the remaining ingredients except spinach. Stir, cover and bring to a low boil. Reduce heat to low to maintain a gentle simmer and cook until the meat is very tender, about 2½ -3 hours. Meat is done when a wooden skewer or toothpick inserted into the thickest part comes out with little or no resistance. Be sure to keep lid on pot during cooking. Add spinach and gently stir in just before serving (optional if you want some greens). Sear beef directly in Instant Pot on saute setting, following above instructions. Once ready to braise, lock on the lid and set to “Stew” setting and cook on high pressure for 45 minutes. Voila! A super simple side dish that comes together on a sheet pan – does it get any easier than that? I created this dish with the holidays in mind when you’re feeding a crowd but don’t necessarily want to spend the whole day in the kitchen. It makes a nice presentation as well when plated on a large platter in case you need to impress your in-laws, mother, or yourself. 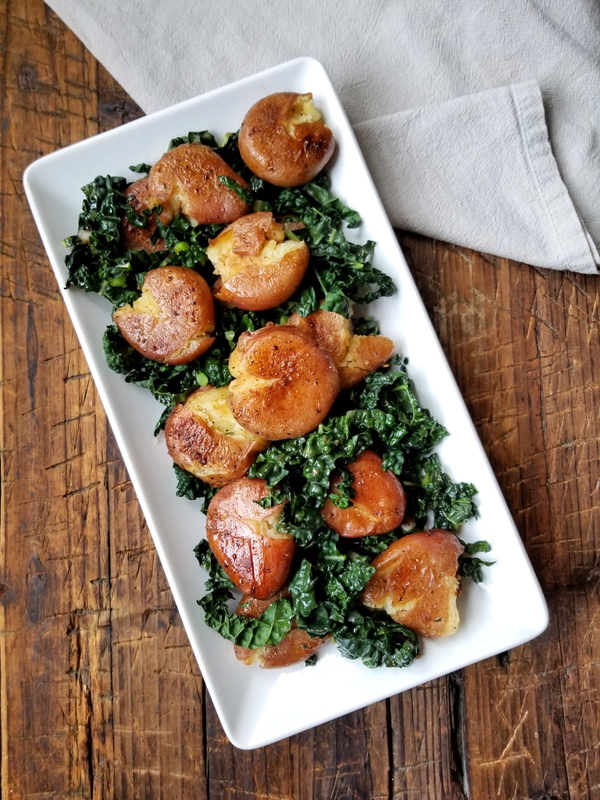 A healthy, Whole30 compliant side dish that is quick and easy to make. On a sheet pan, toss potatoes with ghee, balsamic, salt and pepper. Roast until soft when pierced with a fork, about 30 minutes. While potatoes roast, wash, dry and thinly slice kale, removing the bottom 5 inches of stem. Once soft, remove potatoes from oven, then use the bottom of a cup, or any flat surface to smash the potatoes so they are a little flat. Careful they are hot! 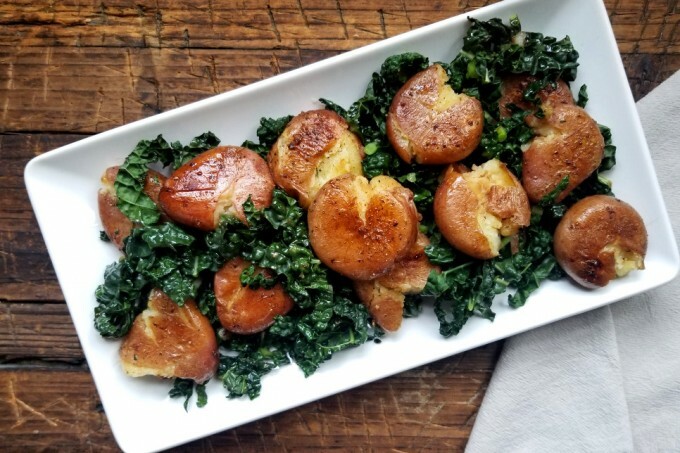 Sprinkle kale over potatoes on sheet pan, then drizzle with the olive oil. As long as the sheet pan isn’t too hot for you to do this (or wait 5 minutes), toss the kale around so it gets mixed with some of the balsamic and oil. Wilt in the oven for up to 5 minutes – it doesn’t take long. To plate: allow pan to cool, then gently toss kale some more with the oil that is on the pan so it soaks up some of that flavor. Then arrange potatoes and kale on a large platter. Use a spatula to scrape any remaining balsamic and oil from the sheet pan and drizzle it over the potatoes and kale. This recipe is so simple it feels like cheating. The idea came to me for this when I was planning a holiday meal with family – I wanted something fun and flavorful but easy because heck no am I spending one of my rare days off in the kitchen all day (I DO still like cooking even on my days off, but if I’m cooking for a crowd I don’t want to be doing it all day long). I picked up a variety of sausages from my favorite local butcher Walden Local Meat. They source all their meat from New England farms and everything is pasture and humanely raised. Protein quality is extremely important to me from a health and sustainability perspective, so the more we can do to support local farmers, the better off we all are. What I also love is that most of their house-made sausages don’t have sugar or any creepy additives! Hallelujah! If buying store-bought fresh sausages, I suggest reading the ingredients to make sure you know what you’re getting. An easy, healthy, quick dinner idea perfect for Whole30 on a weeknight. Cut apple into eighths and thinly slice the onion. 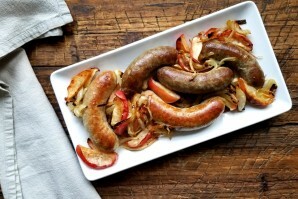 On a large sheet pan, toss apple and onion with most of the ghee, reserving about 1 tsp ghee for searing the sausages. Sprinkle with salt, pepper and thyme. Make sure the apples and onions are spread in a thin layer to encourage some browning – if the pan is overcrowded they will just steam. Place sheet pan in the preheated oven and roast about 15 minutes, until starting to brown and soften. While those roast, sear sausages: heat a large skillet over medium heat, add ghee. When pan is hot, brown sausages on both sides - about 5 minutes per side. Once seared, transfer sausages to the sheet pan in the oven with onions and apples - also drizzle any jus from the sauté pan onto the sheet pan as well. Continue roasting until sausages are cooked through, another 5 – 10 minutes. Sausages should be 165 internal temp and no longer pink. 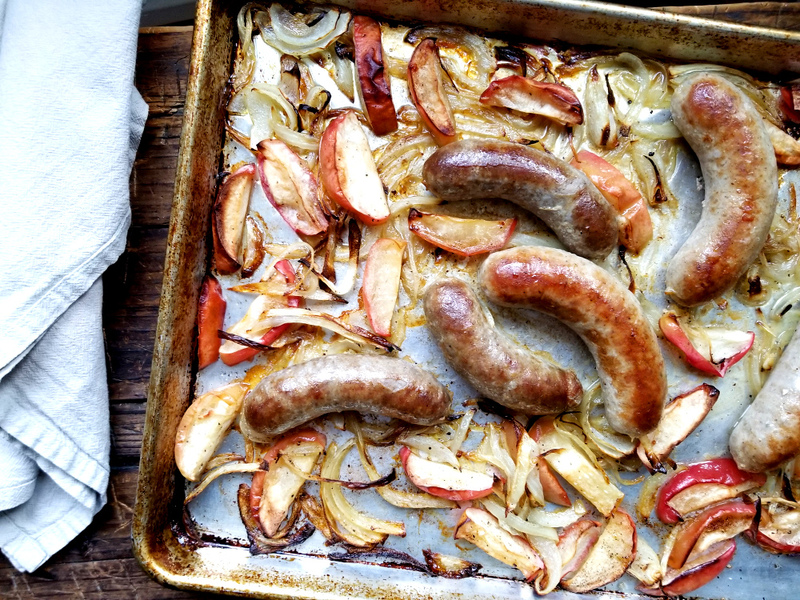 To serve: transfer sausages to a platter, then surround them with the apples and onion and drizzle any leftover jus from the roasting pan over top. At this time of year when it’s chilly outside a warm classic meal like this can really hit the spot. 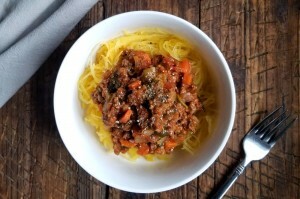 I had a craving for a good bolognese and was actually smart enough to write it down while I cooked this time! I am not the best at doing that. Now, as is always the case for me, I wanted to make sure there were extra veggies in this dish – this way it could really be a complete meal. For those of you with kiddos (or picky husbands, ahem), having small bits of veggies mixed in can help them gobble everything up without a second thought. The key, based on the level of vegetable-pickiness that you’re dealing with, is to make them really small. So chop the veggies to your desired size – and honestly you can even rice them in the food processor if you want them to be almost invisible. If you’re just feeding yourself, well then who cares what size the veggies are and just enjoy this satisfying meal! I definitely recommend serving this over some spaghetti squash or veggie noodles. 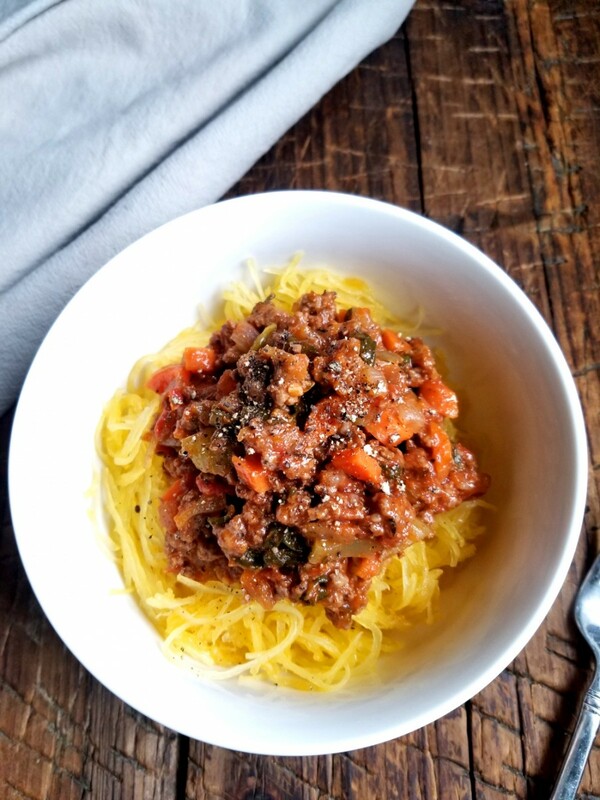 A healthy, Whole30, paleo recipe for classic bolognese that helps sneak in some extra veggies. Easy and ready in 30 minutes. Heat a large skillet over medium heat and melt 1 tsp ghee. When the pan is hot, add the meat and brown until mostly cooked through. Season with half the salt and pepper. Remove from pan and set aside. Return pan to heat, add remaining ghee to melt. Add onion and sauté about 5 minutes until translucent. Add celery, carrots, garlic, herbs and remaining salt and pepper. Saute another 5 minutes until veggies soften slightly. Then add the spinach and return meat to the pan with tomato sauce. Stir to combine, reduce heat to low, cover pan and allow to simmer gently for at least 15 minutes. Optional Additions: feel free to add additional veggies such as diced sweet potato. I am always trying to add in as many veggies as I can to a dish! Perfect for a special occasion, I made this thinking about a new dish for Christmas dinner. 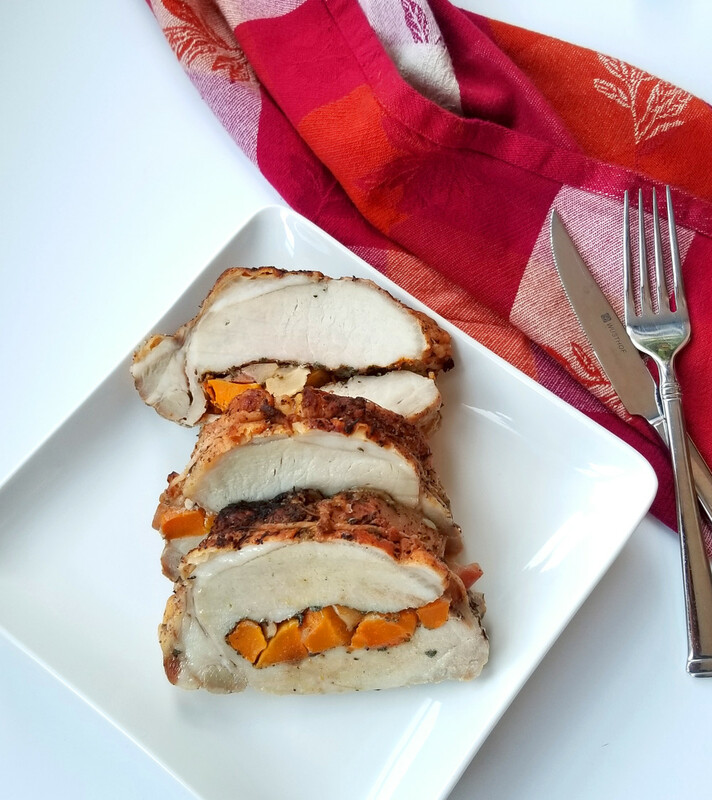 I used pork loin, which is larger and cheaper than pork tenderloin so easily serves more people without breaking the budget. However, bear in mind it is usually pretty lean so if you can get a pork loin with a fat cap on top, that really helps. I picked one up from a local farm, or discuss with your local butcher to see if they can cut you one and keep the fat cap on. 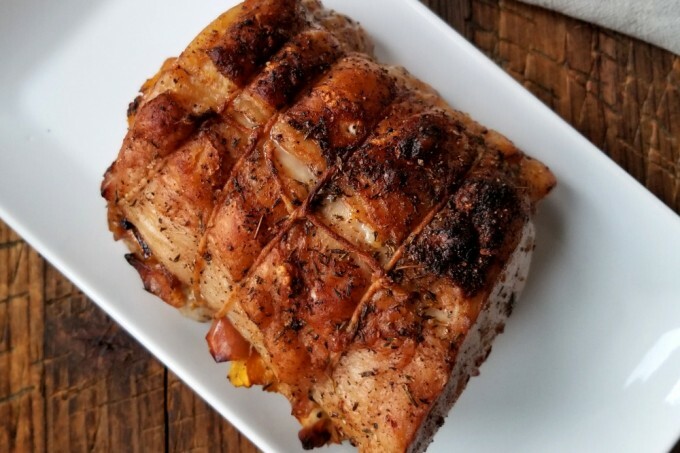 Alternatively I would suggest wrapping some bacon slices over the top of the roast while it cooks to help add moisture and protect from dryness – plus, YUM! 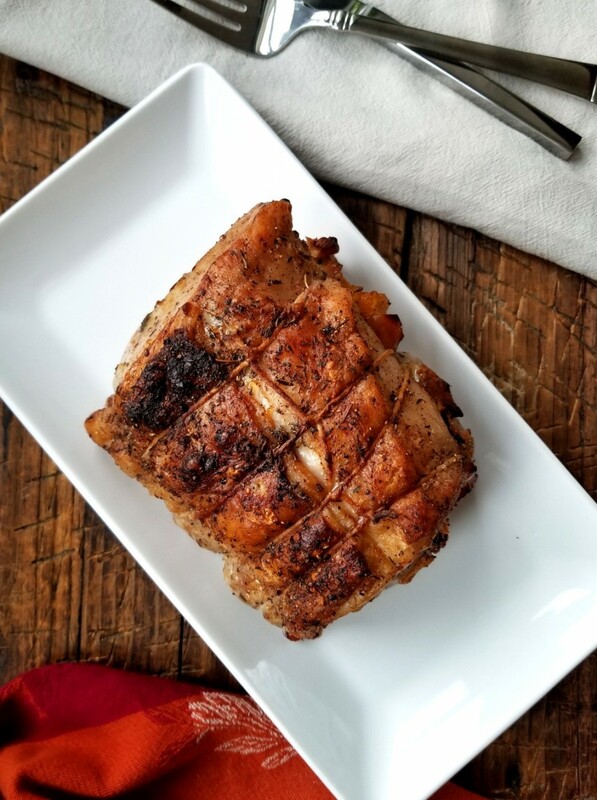 A paleo and Whole30 friendly roast perfect for a special occasion like CHristmas. Who needs ham when you can make this! Special equipment: kitchen twine and kitchen thermometer. 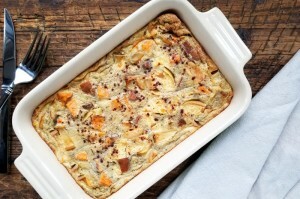 Dice butternut and apples into 1-inch pieces, then spread on separate sheet pans. Toss squash with 1 tsp oil, ¼ tsp salt and the dry sage. Toss apple with ½ tsp oil, pinch salt and ¼ tsp dry thyme. Roast until both are fork tender but not overly soft. Butterfly the pork loin by making a horizontal cut mid-way through the pork so it opens like a book. You want to make the cut width-wise, not length-wise (again, so it opens like a book). Be careful not to cut all the way through – stop about 1 inch before cutting all the way through. Open the loin up like a book, then rub it all over with the remaining salt, dry thyme, black pepper and remaining oil (rub all sides). It should feel generously seasoned. For the filling: layer the butternut, apple and fresh chopped sage on the bottom part of the loin, then close it up. Use the kitchen twine to tie the pork closed in 4 places – a simple loop and a knot will do. 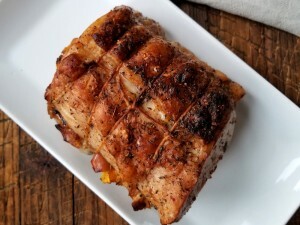 Place pork in a roasting dish – if any filling slips out, just stuff it back in around the edges. This is the best point to let the roast marinate for about 30 minutes or place in fridge overnight and roast the next day. Roast 20 minutes then baste with any juices that have collected in the pan. Rotate dish, roast for another 20 minutes, baste again. Roast until internal temperature reads 140, about 45 minutes. I made this recipe on a whim and oh brother let me tell you it’s yummy! Sometimes, our best creations come when we’re just throwing stuff together for fun. I had 3 really ripe pears that needed to be used up, and in the fall there’s no flavor combination I love better than apple, pear and cranberry. I also specifically wanted to make it nut-free and with no added sugar to keep it a.) healthy and b.) friendly for the nut allergy people in my life. I know baked goods, especially in the paleo – blogging – sphere, tend to be made with almond flour because it’s so easy to work with. That can be frustrating if you’re looking for a dessert recipe that’s gluten-free or paleo but also nut-free – so here ya go! A comment on the topping: because it gets browned really fast in the oven, I cook the fruit filling first on the stove (it cooks really fast) and then assemble the whole dish and only bake it until the fruit bubbles through and the topping is browned. A heathy, gluten-free, paleo version of apple crisp that is also nut-free and has no added sugars. Chop apples and pears into 1-inch pieces and place into a medium size pot along with all the other filling ingredients EXCEPT the arrowroot/tapioca flour. Heat over medium, covered, until starts to steam, then reduce to low and stir occasionally just until apples start to get soft. Stir in the arrowroot or tapioca flour and remove from heat. While the filling cooks, preheat oven to 350 (325 for convection ovens). Quarter the figs and halve the dates, then place into a food processor with the sunflower seeds. Pulse the processor until the fruit starts to break down and combine with the seeds. Then add the coconut flour, cinnamon and salt. Pulse to combine again, then add the ghee and pulse to combine. The mixture should be a bit sticky but crumbly looking. If you over-process it will get more like a LaraBar consistency (paste-like). Pour apple filling into a 9-inch pie dish. Using your fingers, crumble the topping over the top of the filling - don't pack it down, just crumble it gently and let it fall wherever it falls. Bake for about 20 minutes just until the fruit can be seen starting to bubble through the topping and the topping is a little browned but not burnt. If you want it to bake longer but the top looks too brown, cover with foil. 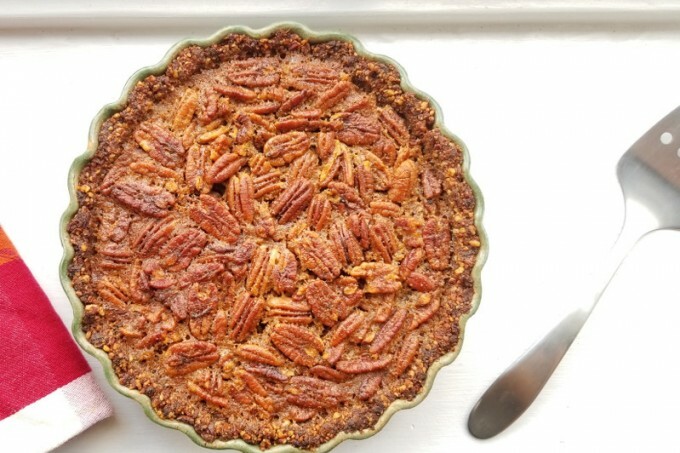 Pecan pie is something I have strong memories of making at the first bakery I worked as a pastry chef. Thanksgiving was insane there, because we made pies. 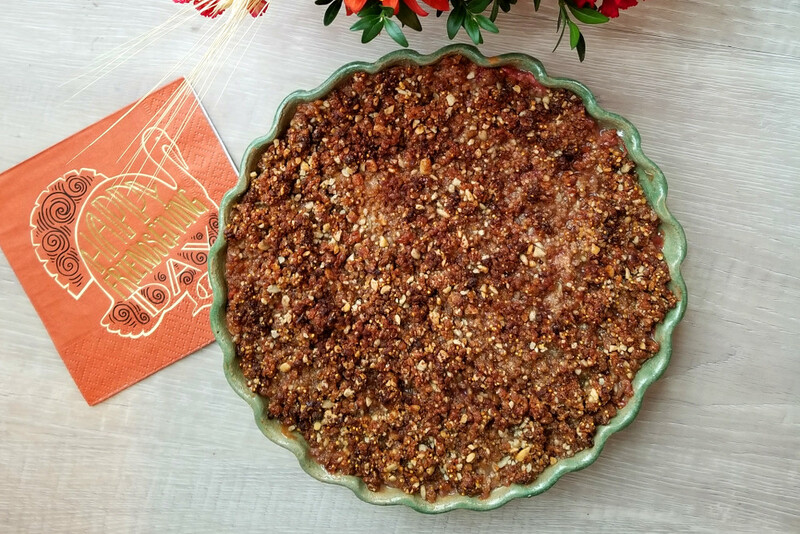 In all the years since then, I haven’t made pean pie again because it’s so sweet – even “healthy” versions are pretty sweet for me. But this year, I got some requests for a “healthified” version, so I thought, why not play around! This recipe is still sweet to me because I don’t personally put sweetener in much of anything I eat these days. I just feel better without sugars in my life. BUT IT’S THE HOLIDAYS so let’s have some fun! I would say, if you are used to really sweet, traditional pecan pie, this won’t taste too sweet to you, and if you’re like me and don’t need much sugar, maybe take out 1 Tbl of the sweetener. Your choice. Let’s talk about the crust quickly – as per my usual approach to cooking, I rather not use sugars, so I used dates. Dates still have a lot of natural sugar, so this is still a sweetened crust, just no added sugar. This is a simple crust and you could use it for pumpkin pie too – or any type of pie for that matter! 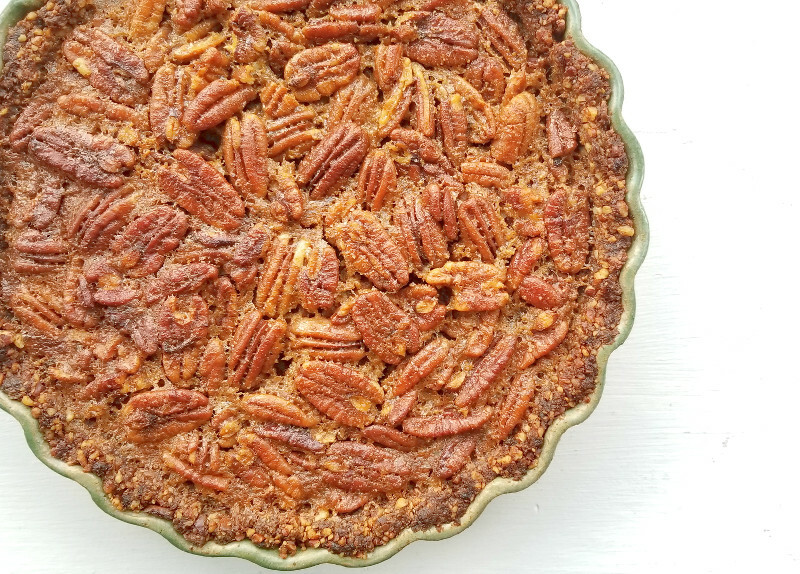 A Paleo, gluten free, grain free and low sugar version of traditional pecan pie. Enjoy the holidays without all the corn syrup! In a small bowl, combine the flax and water, stir and set aside. Pulse the pecans and chopped dates in a food processor until resemble course meal. Add the salt, cinnamon and flax mixture, pulse again, to evenly combine. Use a rubber spatula to scrape down the sides of the processor bowl to make sure the mixture is getting evenly mixed. Pulse again. Grease a 9 inch pie pan with some ghee just to coat the surface. Press the mixture into the greased pie dish, using your fingers and palm to press and shape the crust. I have a video on Instagram that shows me doing this step! Bake off the crust just for 5 minutes to help it set. In a medium mixing bowl, whisk to combine the eggs, vanilla, sweeteners, salt, coconut milk. Add the ghee, whisk, then add the pecans and coconut flour, whisk to evenly combine. Pour filling into crust. Use your fingers to gently arrange the pecans so they are mostly all flat. Bake until filling is mostly set and not jiggly, but still has a slight give in the center. Like a gentle ‘bounce’ when you press lightly with you finger. About 30 minutes. If your crust starts to get brown on the edges while filling is cooking, tent the pie with some foil so it’s covered. 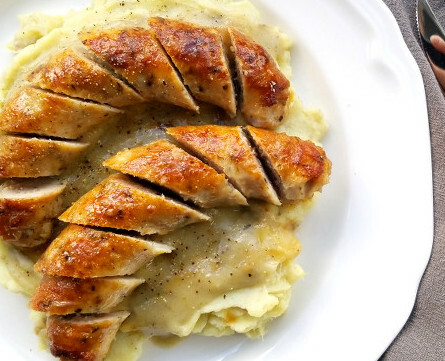 This recipe is simple yet oh so satisfying. 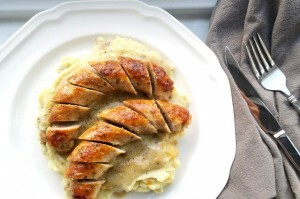 You can’t beat mashed potatoes and gravy, can you? I am really excited to share this gravy recipe since it is not only gluten and dairy free, but it is made without using any type of paleo flour at all. My digestive system doesn’t agree with almond flour and I try to avoid using almonds in general. Why’s that? Their sustainability is not so great and they are being so overused these days (if you haven’t looked into more information on the California almond industry, I recommend it if you like to learn). I also tend to not feel great from coconut flour either, but I know some people are fine with it. For the sake of this recipe, I wanted a gravy that was strictly based on veggies and broth. Voila! I recommend making extra gravy and keeping it around to add to meals during the week or freeze it for future use. In a medium pot, heat coconut oil pver medium heat. Add the onion and sweat until softened, then add the celery and garlic, sauté 5 minutes. Add the potato, salt, pepper, herbs and stir together, then add the broth. Cover and simmer until potatoes are soft. Remove from heat, add the aminos and coconut milk. Use an immersion blender to puree, or transfer carefully to a blender and puree. Chop potatoes into 2 inch chunks, put in a pot and cover with water (peeled or unpeeled, your choice). Bring to a boil and simmer until soft. Strain, then place in mixing bowl. Whisk in broth slowly, then add ghee and salt. Add coconut milk if using for extra creaminess. Adjust seasoning as needed. Heat a large skillet over medium high heat, add the ghee. When pan is hot, add the sausages. Sear until nice and brown on one side, then flip and sear second side. Reduce heat, cover pan with a lid and finish cooking sausages to an internal temp of 165.